It is with high expectations that we try Burger Box’s new eat-in branch in Causeway Bay. The chain, which also has a takeaway shop in Central’s Pier 7, is one of a growing number of gourmet burger brands currently lining Hongkongers’ stomachs. But can this new outlet keep up its previous standards? 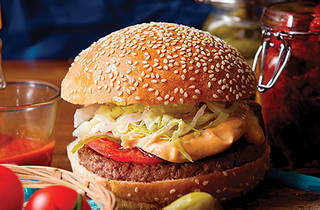 Burger Box’s new location is nestled in the diner-friendly World Trade Centre with a standard enough Western ambience. Service is efficient here but we would prefer a few more smiles from the waiters. 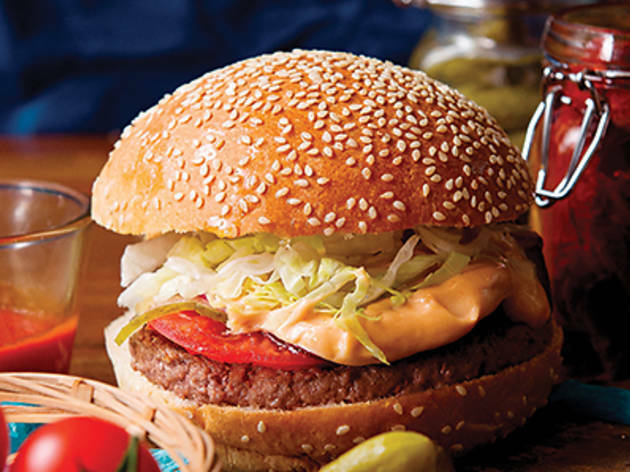 The menu includes an interesting variety, from classics like the bacon cheddar cheese burger ($55), to novelty options, like the kimchi burger ($55), as well as a lavish foie gras aioli burger ($59), the most expensive item on the menu. All burgers come wrapped in paper and served on plastic trays, à la an American diner and each combo meal (+$23 for fries and drink) scores points on presentation, looking deliciously retro. We decide to try all three of the aforementioned burgers. The quality of beef is decent, although on our visit, it’s cooked slightly inconsistently across all three burger choices, with medium working best with the strong and tasty ingredients of both the kimchi and bacon cheddar burgers. Unfortunately, the foie gras burger disappoints, with only a mere hint of foie gras flavour and hardly any visible aioli sauce taste. The fries, on the other hand – both the well-garnished spicy and truffle fries ($24 à la carte; +$4 combo) – are executed to near perfection: they are golden-brown in colour, and have a delectable oily crunch that remains intact, even after cooling down. Shop P211A, WTC More, 280 Gloucester Rd, Causeway Bay, 2894 8238; cafedecogroup.com. Daily 10.30am-9.30pm. Dinner for two: around $150.